Don't just light up your outdoor signage- illuminate it with style using our aluminum gooseneck Emblem lighting. With timeless character, these exterior RLM gooseneck lights look just as good in the daylight as they do after sundown. Offering you the highest quality of lighting convenience and designer sophistication, our gooseneck lights are a way to instantly upgrade your façade while ensuring that your business is noticed after dark. Available in a wide variety of colors, these exterior gooseneck lights feature a curved arm and round Emblem shade that directs a warm pool of light directly onto its focus area. Use one to illuminate a small sign or doorway or light up an entire façade with glowing brilliance. As a general rule of thumb, sign lighting should be placed every 3 to 4 feet of sign or awning width. Our attractive gooseneck lights with an Emblem shade are designed specifically to your custom requirements to perfectly match your exterior décor and theme. 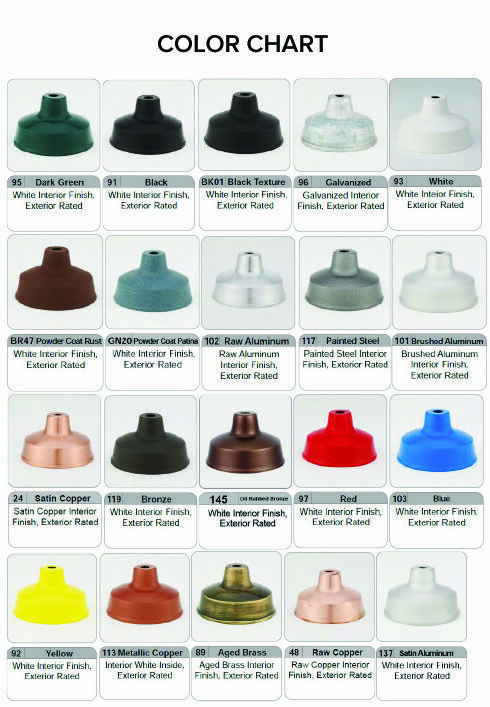 We offer 20 distinct color options, all in a high-quality powder coat finish that is resistant to rust. For modern applications we offer eye-catching primary colors. And for a more traditional taste we also offer a number of realistic faux-metal finishes like Aged Brass and Raw Copper. With our convenient exterior gooseneck lights you don't have to be an electrician for successful installation. That's because each gooseneck Emblem lighting fixture comes with everything you need to mount over a standard exterior 4" diameter junction box. The gooseneck arm is attached to a 4-5/8" round aluminum wall mount back plate that is finished in your color choice. Each back plate has mounting holes that are 3-1/2" on center. The medium base incandescent ceramic socket is wired for 120V service. Our customer service representatives are always happy to talk to you if you have specific mounting requirements or have questions about lamping options.